This month, Clair decided to go in the other direction rather than Portsmouth way. 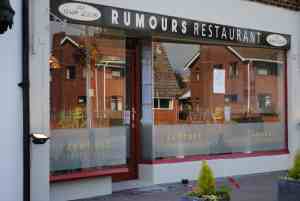 We ventured to Warsash near Southampton and tried Rumours. It is a small restaurant in the centre of town, but Clair had heard rave reviews by spanning the website and once there, the Grubgang found out why! The venue is a little cramped and could do with a table being taken away, just to create a bit more space. But, they make the best of the little room they have and by walking in, you can sense a feel of community (it was busy even on a Wednesday- a good sign!) and a relaxed atmosphere. There are various specials to choose from and an extensive main menu, plus a special set menu which you can use to get a 3 course meal for only £11.55!!! Bargain!! The food is within Grubgang price, if you use the main menu you will need to be selective. The food is served at a good pace, even when busy and tastes delicious! The risotto had lots of flavour according to Grubgangs male members and the ladies certainly enjoyed their chicken and pasta dishes! The service as well as prompt, is friendly and warm. You feel comfortable and relaxed in the venue and we were even asked if we wanted a break in between second and last course (First time we have ever been asked that!) If anything, we would recommend more desserts on the menu as they seemed to be less exciting then the other courses, but still homemade and very delicious!! I would say Rumours is well worth a visit. Make sure you book though, as it seems a very popular place. They also are open for breakfast and lunch, so if you are in the area, you can try it at any time of the day! !